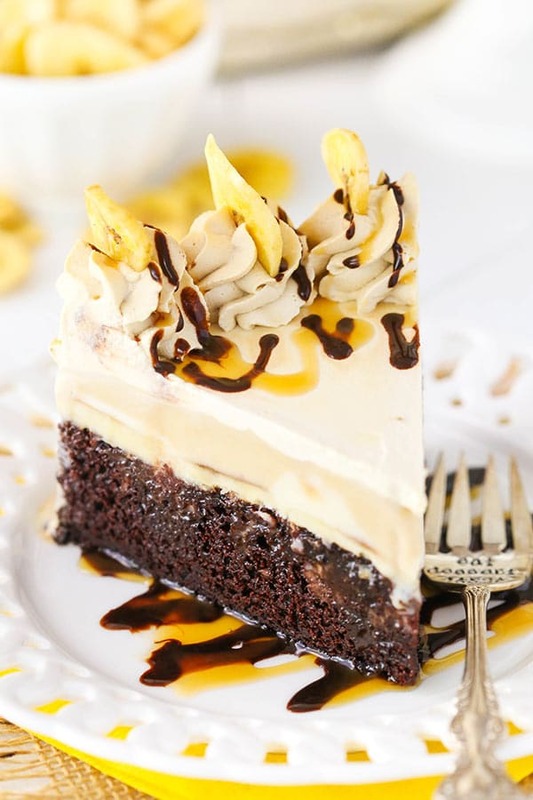 This Banana Mocha Chocolate Ice Cream Cake is SO good! I’m a little obsessed. 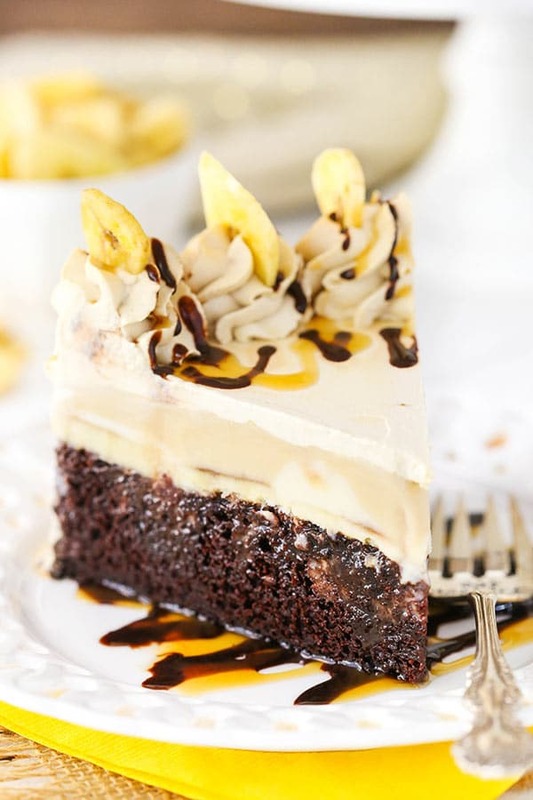 The moist chocolate cake is topped with sliced bananas, caramel and chocolate sauce, and banana and coffee ice cream! The flavors are amazing and the ice cream is perfect! This post is sponsored by ENLIGHTENED Ice Cream, but all opinions are my own. In an effort to find a good ice cream that’s a little more guilt-free than usual, I’ve tried a few of the healthier ice creams option out there. I’m around sweets quite a bit, so a healthier option is sometimes quite nice. So when ENLIGHTENED ice cream wanted to send me their new ice cream flavors to try, I seriously couldn’t wait. The day they arrived in the mail, I literally ran to door and pulled the pints out of the box as quickly as possible. My parents were in town and had just arrived and my dad was equally as excited, guarding them on the counter with a spoon. The ice cream pints arrived with dry ice so they were quite firm and we had to exercise a bit of restraint and wait for them to soften. With a higher protein/lower fat ice cream, it’s often better when allowed to soften a bit before digging in. It’s hard to wait, but totally worth it. And these new flavors were TOTALLY worth it! I pulled one out during The Bachelor last week and before I knew it, I looked down and someone had eaten all of my ice cream. 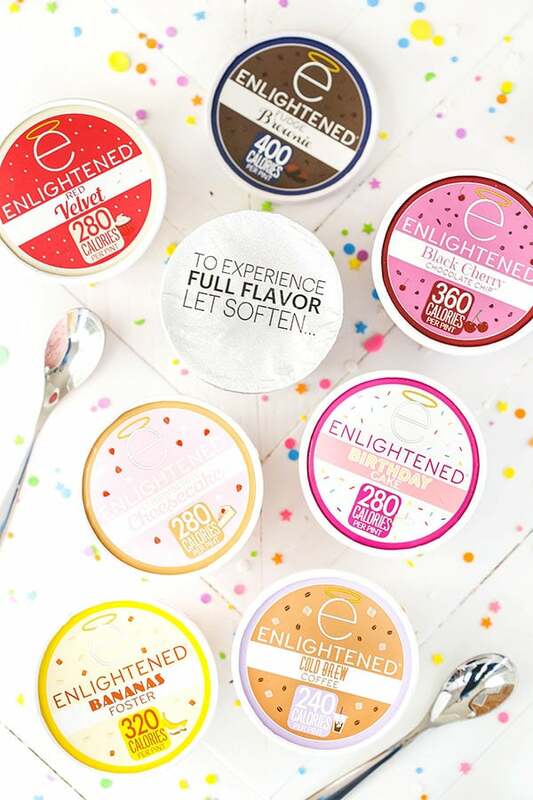 😉 I really think the texture of the ENLIGHTENED ice cream is some of the best I’ve had. SO creamy! And the flavors are terrific. So good that it was hard to decide which ones to use in an ice cream cake. I kind of just wanted to take a spoon to all of them. 🙂 I’m so glad I made the choice I did though. The flavors are amazing together and it makes such a wonderful ice cream cake! 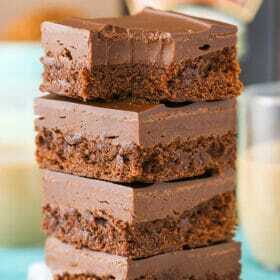 To start, there’s the moist chocolate cake for the bottom layer. It’s a super easy cake to put together. Once it’s cool, you can build the cake. To get a nice, tall cake I used an 8 inch pan. The best way to set up the pan for layering is to place some clear wrap over the bottom of the pan that sticks up above the edges of the pan. Once the cake is frozen, you can use the wrap to lift the full cake out of the pan. Next, add a cardboard cake circle to put the cake layer on top of. It makes it easier to lift and move the cake around later. The final step would be to add some parchment paper around the edges, kind of like this. It helps to keep the cake and ice cream from sticking to the sides of the pan and ensures that it doesn’t overflow. Instead of parchment paper, you could also use a clear cake collar. 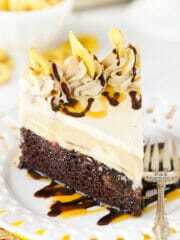 The chocolate cake is then covered with sliced bananas and drizzled with chocolate and caramel sauce. Next is the ice cream. 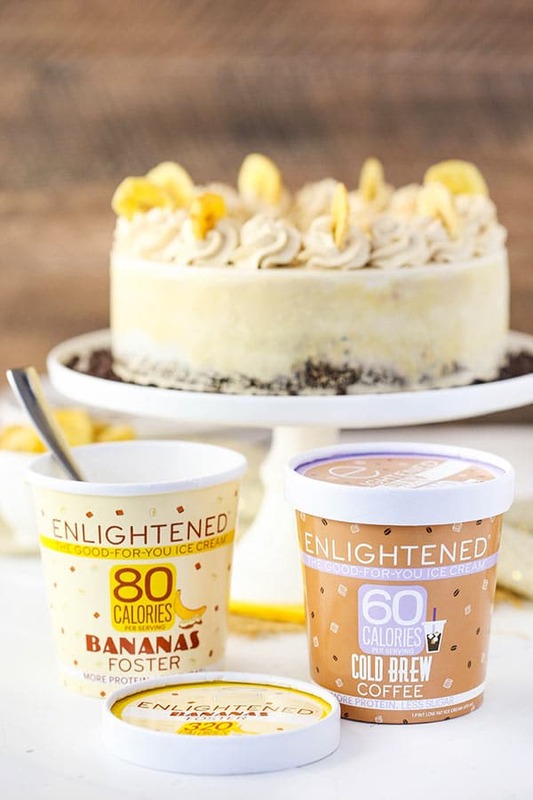 I used one pint each of the Bananas Foster ENLIGHTENED Ice cream and the Cold Brew Coffee ENLIGHTENED Ice cream. The bananas foster has a ripple of caramel through it and the cold brew coffee is pure coffee. You’ll want to let the ice cream soften before adding it to the cake. I found it worked perfectly to set the ice cream in the fridge for an hour or so to soften. Then I scooped small spoonfuls of ice cream on top of the cake at a time to help smooth things into an even layer. I added the bananas foster first then the cold brew ice cream. 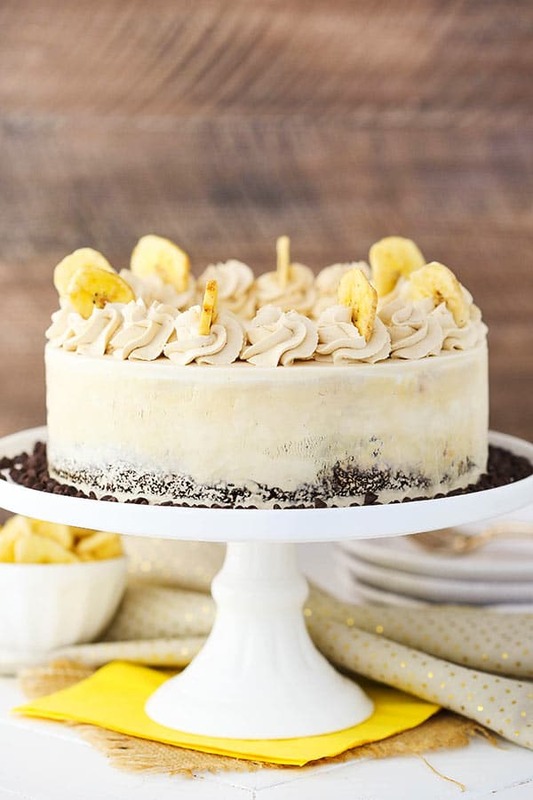 Once the cake is frozen, it’s covered lightly with a coffee flavored whipped cream, some whipped cream swirls and banana chips. It can be placed back in the freezer until you’re ready to serve it, but do be sure to let it sit for a bit before serving – it gets quite firm. You can let it sit in the fridge for 30 minutes to an hour or let it sit out on the counter. The nice thing about the fridge is it doesn’t melt quite as quickly but softens well. This ice cream cake is seriously SO GOOD! I can’t even fully describe it. 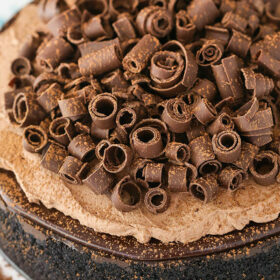 The chocolate and caramel sauce soak into the chocolate cake, making it super moist and tasty. 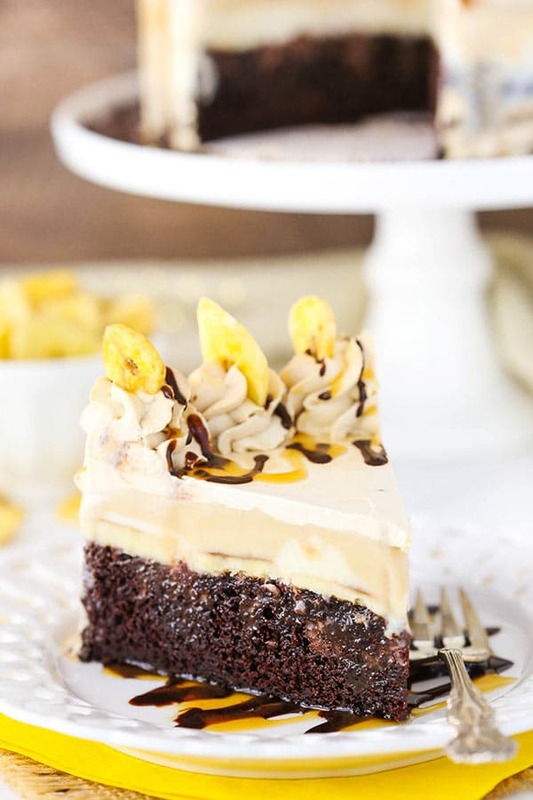 The banana and coffee ice cream are perfect together and go so well with the chocolate cake. Plus, they are so creamy and delicious! 1. Preheat oven to 350°F (176°C) and prepare an 8 inch cake pan with non-stick baking spray and parchment paper in the bottom. 6. Pour the batter into the prepared cake pan and bake for 27-30 minutes, or until a toothpick comes out with a few moist crumbs. 7. Remove the cake from oven and allow to cool for 3-4 minutes, them remove to a cooling rack to finish cooling. 8. Once the cake is cool, set up an 8-inch cake pan (or springform pan) for layering. If not using a springform pan, you can put some plastic wrap in the bottom of the pan and up the sides and use it to lift the cake out of the pan when it’s done. Put a cardboard cake circle in the bottom of the pan. Line the sides of the pan with parchment paper. 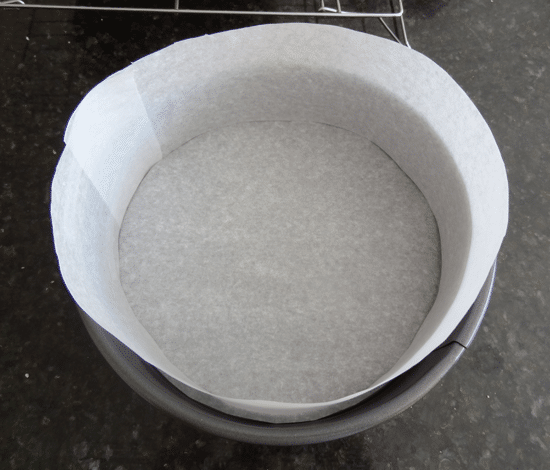 The parchment paper should stick up above the top edge of the pan (see example). 9. Cut the dome off of the top of the cake layer, then place the cake layer into the bottom of the pan. 10. 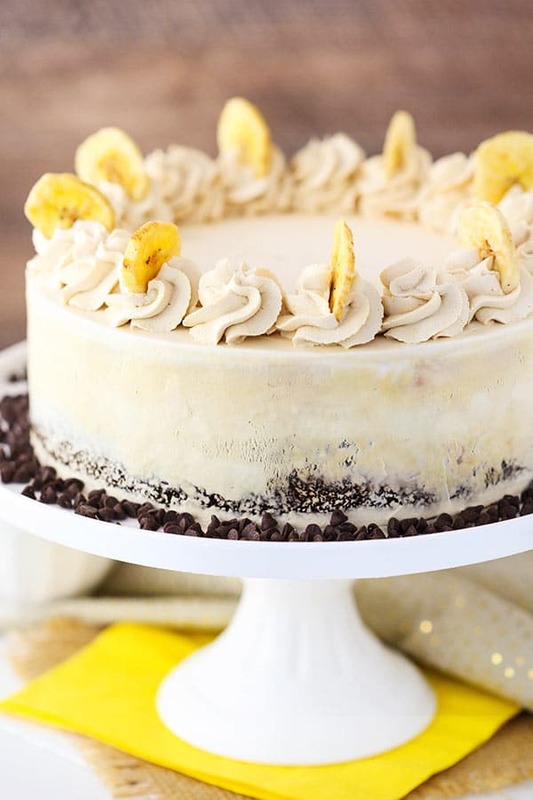 Add banana slices in a full even layer on top of the cake. 11. Pour the chocolate and caramel sauce over the banana slices. 12. 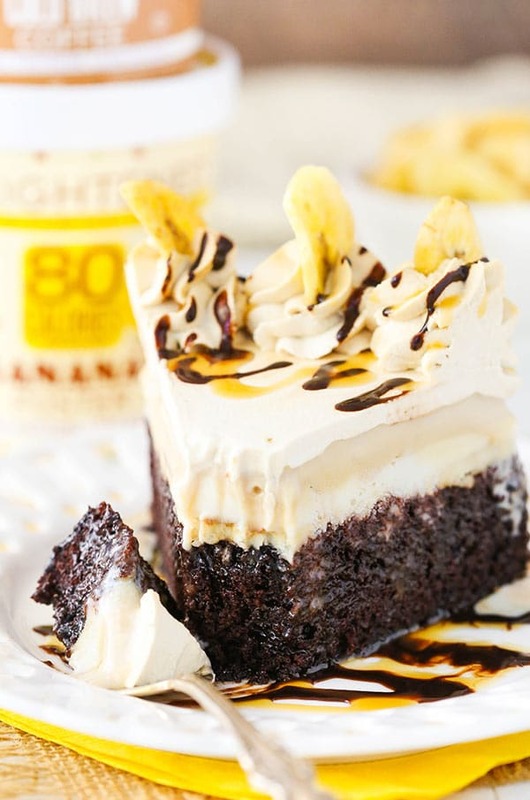 Add small spoonfuls of softened bananas foster ice cream and spread into an even layer. 13. Add small spoonfuls of softened cold brew coffee ice cream and spread into an even layer. 14. Freeze the cake until firm, 5-6 hours. 15. To prepare the whipped cream, add the heavy whipping cream, powdered sugar and instant espresso to a large mixer bowl. Whip on high speed until stiff peaks form. 16. Remove the frozen cake from the pan and lightly frost the outside with the whipped cream. 17. Pipe swirls around the top edge of the cake and top with banana chips. 18. Freeze until ready to serve. If this is anywhere near as good as it looks, this is a real winner. I’m drooling thinking about a bite. i had a storebought ice cream cake recently and was disappointed by how dry the cake was. craving some of this right now! and bananas foster ice cream?! ??? ?